[prMac.com] New York City, New York - VidoOn.me proudly announces the newest version of its mobile app, VidOn Player for iOS and Android devices. Users can save nearly any video, including .AVI files, to their mobile device and take their favorite movies, music and personal videos on-the-go. 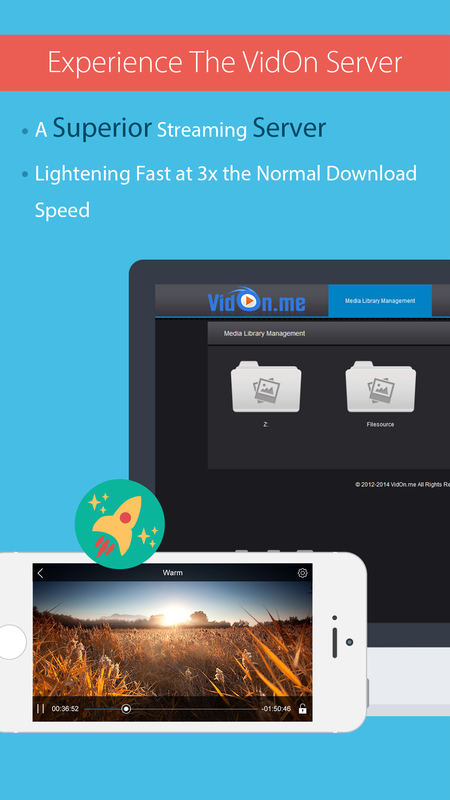 As creators of the popular VidOn Box, VidOn.Me is making it even easier for people to enjoy their media files anywhere! The VidOn Player app is the easiest tool on the market for PC users to upload or stream their videos, photos or music to any of their mobile devices. VidOn Player allows you to simply drag and drop your favorite movies in nearly any format from your computer to your iOS and Android devices or upload them through an FTP server. "Enjoying movies from home is great, but people in today's working world need the ability to take their favorites with them," said James Qian, an employee at VidOn.me. "The VidOn Player mobile app let's people upload or stream their movies, in nearly any format, onto their mobile device with exquisite visual quality and phenomenal speed." VidOn Player HD 2.2.1 is free and available worldwide through the App Store in the Entertainment category. There is also an Android version available. VidOn.me is an innovative technology company focused on creating solutions for media consumers around the world. Whether it's through home-cinema equipment or mobile streaming software, VidOn.me has been leading the way in the visual media space for nearly three years, and is well known for its customized VidOn XBMC. All Material and Software (C) Copyright 2014 VidOn.me. All Rights Reserved. Apple, the Apple logo, iPhone, iPod and iPad are registered trademarks of Apple Inc. in the U.S. and/or other countries. Other trademarks and registered trademarks may be the property of their respective owners.